I've long been thinking about plants and roots and weeds as I garden. Even when I close my eyes, I see weeds! 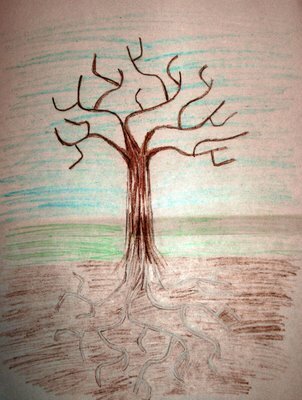 I chose to draw a tree - bare bones, of course, to illustrate "Opposites." 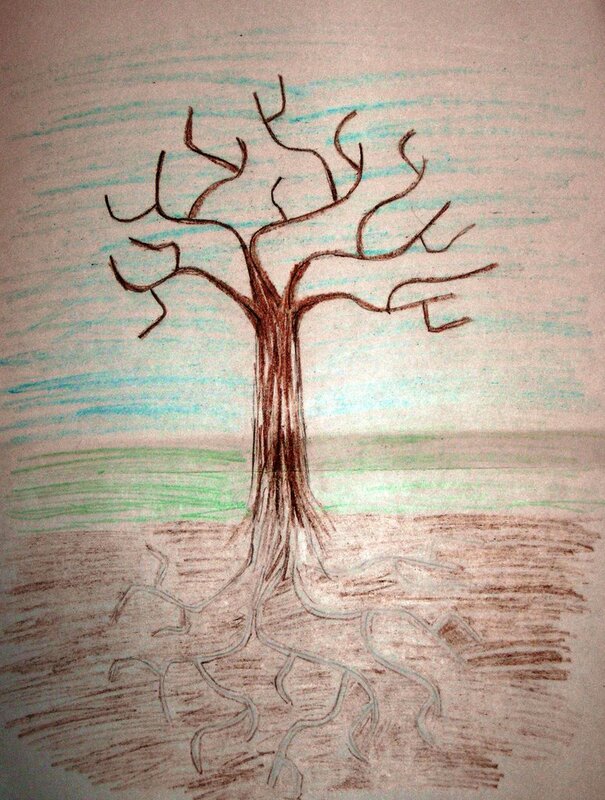 In my image, I drew the roots as an exact mirror of the branches to illustrate the opposing forces of branch vs root. The branches reaching up are held by the roots reaching down. It's only this Push-me-Pull-you state (if you will - it was my favorite Dr. Doolittle animal! )that keeps the tree alive and growing against gravity. Might this illustrate Newton's Law: For every action there is an equal and opposite reaction? Tree grows UP, then tree must grow DOWN. Forgive my trampling of biology, but it seems that the two need each other to survive? Opposites attract. I also like the concept that while the branches are free to swing in the air and sunshine, the roots by contrast are locked firmly in place in the dark depths of earth - 2 more opposites: motion and stasis (STASIS Etymology: New Latin, from Greek, act or condition of standing, stopping, from histasthai to stand -- see, STAND). you're a good artist. You explain things really well too. I wish I could do that. That's why you're such a good writer! ;) ps-I wrote "Superb Saturday" for you--although I dont think it makes sense!! Haha--see told you I cant write. A static page is linked to your blog's time and date. Go to your blog, click on the time and date of your post. You'll notice that the window changes to only show that one particular post. That is the url you should use to link to Illustration Friday. That way, in the future, when people go looking for your post, they will find it easily.